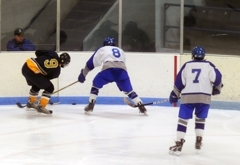 The Hermantown and Virginia rivalry has gone back for years with ups and downs for both teams. It was most bitter when the two teams were in the same section and seeding was a factor in everyone’s mind. But even with the teams in separate sections, the rivalry has moved to a new level. 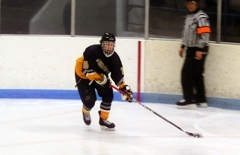 With state ranking implications in mind, Hermantown traveled to Virginia to put its unbeaten streak on the line, and the Hawks would stay that way through six games as they handed the Blue Devils a 5-2 loss. 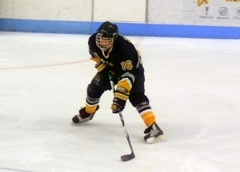 Hermantown has been unbeaten against Virginia/MIB since 2005 when they lost in overtime in Virginia. 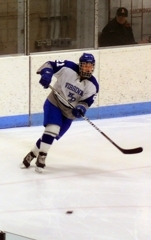 Current Dallas Stars defenseman Matt Niskanen played in that game for the Blue Devils. The game saw 17 total penalty minutes, 13 of which belonged to Hermantown. The Hawks killed off all their penalties, including a five minute major spanning the last two periods off of a Joe Jicks kneeing penalty. The Blue Devils were 0-5 on the power play while the Hawks went 1-2 to keep their season power play average at a spot on fifty percent. Coach Hendrickson was less than happy with his team’s performance on the power play and their play overall, but they players weren’t happy with their performance either. “We tried to get as many goals as we can because even if we score that guy can’t come out of the box, but we couldn’t score on them” said Garret Hendrickson. Hermantown took the first lead of the game with just over nine minutes left in the first period off of an unassisted goal from defenseman Jake Zeleznikar. Then, with 8:32 left to play in the second period, Hermantown’s Billy Grillo gave his team a 2-0 lead. Virginia was down but not out as Hendrickson skated down the ice into Hermantown’s zone. Bothered the entire way, Hendrickson was forced into the corner but not before he attempted a weak backhanded shot at Connor Lucas. Lucas went down into the butterfly position but as he slid to his right the puck tricked through his pads and slid into the goal. Shortly after the Hendrickson goal, Hicks headed to the box for his five minute major and Hermantown had to keep the dangerous Blue Devil power play at bay. And they did just that off of stellar goaltending from Lucas. With the reputation of the way the Range refs call penalties seeming to stay true, although they were making good calls just not to both teams at some points of the game, Coach Plante needed to keep his team in check and focused. 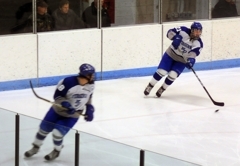 The Hawks killed off the rest of the five minute major and put the game away with three third period goals from Owen Stauber, Andrew Mattson and Bo Gronseth. The Blue Devils lone goal came from Tom Norlander with just under two minutes remaining in the game. That goal brought the Blue Devils back to within three goals, but so little time left it was too little too late. 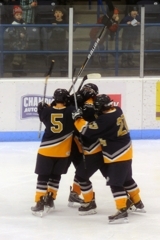 Hermantown will take its 6-0 record to the Heritage Sports Center on Thursday, December 23rd to take on Duluth Central; while Virginia/MIB’s next game will be during their holiday tournament as they host Lakeville North on Tuesday, December 28th. 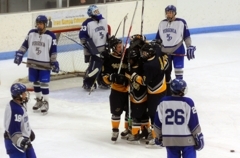 Stauber scored the game winning goal and also got an assist in the game. His game winning goal came just moments after the Hawks killed off their five minute major penalty, which really shut down the Blue Devils and put away the game for Hermantown. 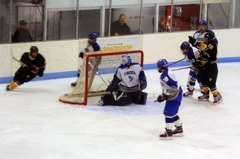 Lucas stopped 24 shots en route to a 5-2 victory and extended the Hawks unbeaten season to 6-0. He made some brilliant saves, especially on the penalty kill to keep the Blue Devils from making a comeback. Lucas is now 4-0 on the season with a .933 goals against average. 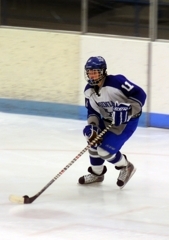 Hendrickson scored the lone goal in the second period for the Blue Devils on a weak backhanded shot, which slipped past Lucas. Hendrickson’s goal brought Virginia back within a goal and gave his team some much needed momentum to try and stop a five game losing streak to Hermantown.